Iowa State University scientists have taken a journey through the past by studying the genetic changes in corn brought about by domestication. A study published in the peer-reviewed academic journal Genome Biology spotlights how demography, or changes in population size, shaped the genetics of corn. 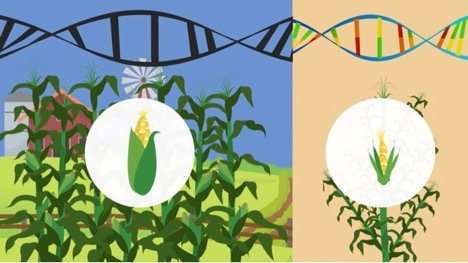 The study shows how genetic "bottlenecks" imposed by domestication of corn plants increased the prevalence of disadvantageous mutations present in the crop's genome today. Matthew Hufford, an assistant professor of ecology, evolution and organismal biology and senior corresponding author of the study, said understanding a crop's history allows scientists to predict with greater accuracy how domesticated species may respond to new environmental conditions. The study's most significant findings are summarized in an animated video from the journal. "Natural selection usually works best when you've got larger populations," Hufford said. "Otherwise, drift and chance can increase the amount of deleterious alleles, and that's what we see here."